This is the fifth and final of our Supply Chain Essentials blog posts. This post looks at HighJump Labour. This is an optional module that extends the functionality of the HighJump suite of products. Each of the Supply Chain Essentials modules integrates with your HighJump installation and is added onto the HighJump Platform and your core HighJump warehousing software product. HighJump Labour only integrates currently with HighJump Advantage. HighJump Labour is a workforce management app that helps warehouses to control staffing and maximise its use. It tracks, measures, reports and plans labour activities within the warehouse to improve efficiency. Not only does it help to objectively measure how your staff are performing, but it also identifies those who need assistance, as well as those who consistently outperform targets. Inherent visibility tools provide real-time data on how staff are being utilised and how they are performing against your established targets and standards. This allows you to spot where there are inefficiencies and take action to correct them. Indirect labour can also be tracked and evaluated in the same way, ensuring you reduce costs in all areas of the warehouse staffing. HighJump Labour gives you valuable insight into your staffing. You can set time value targets for each activity that staff carry out, based on your warehouse’s own circumstances and standards. Then, you can track and report on work patterns to give you full visibility of days worked and performance within that. HighJump Labour generates precise travel times, based on both distance and the equipment used. You can also build in additional time allowances to give a more realistic expectation of what your staff are capable of. This gives accurate time calculations according to the role, the goods and the warehouse conditions. Monitoring progress in real-time allows you to take corrective action when needed, increasing your efficiency throughout the day. Resource planning and allocation are simple to manage, even allowing you to account for seasonal demand fluctuations. You can set and measure individuals’ performance, using benchmark information and historical performance data. This can be used in tandem with performance appraisals to set personal goals for each operative. Staff can monitor their own performance in real time too, with their estimated versus actual performance displayed on their RFID devices. This will empower your employees to use performance indicators to take ownership of their work and to benchmark their own improvement. For enhanced staffing analysis and to examine trends, you can drill down further into performance statistics, looking at a department, a shift or even an individual. HighJump Labour is an excellent tool for larger warehouses; those with around 50 or more operatives. It’s relevant across industries, so whether you’re a retailer of consumer goods, a pharmaceuticals supplier or a food and drinks distributor, then you can still use it to control and maximise staffing in your warehouses. 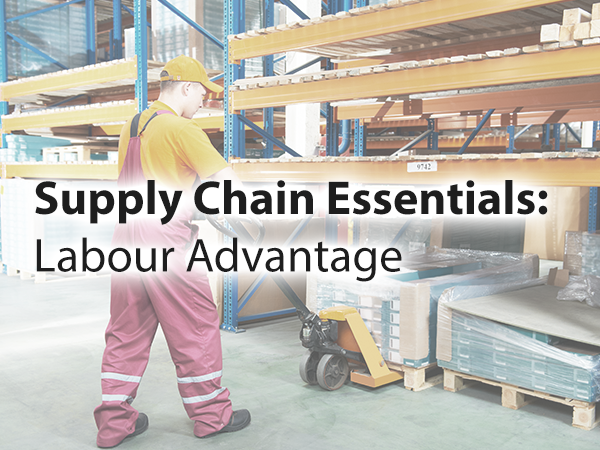 If you would like to find out more about HighJump Labour, and how it and the other Supply Chain Essentials modules can benefit your warehouse operation, download the HighJump Essentials for Supply Chain Advantage leaflet.